Historic photographs found on WhatWasThere come in with source information and more details to help you Google Street view it. You can also use the ‘Explore Photos’ feature to search for historical photographs related to any place in the map. You simply select the location you are interested in and you will be able to see the historic imagery available for that place. WhatWasThere is still a work in progress and much content is still lacking. 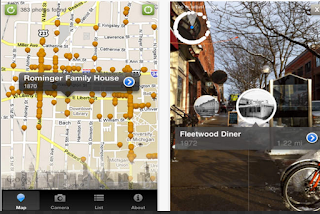 But users can help by adding photographs to the map. The upload feature is available only for registered users. Registration is totally free.